Geronimo, a member of the Bedonkohe Apache tribe, was born in Arizona in 1823. His original name was Goyahkla (He Who Yawns). Mangas Coloradas and the Bedonkohe moved to Janos. In 1850, while the men were away, the Mexicans killed the camp's women and children. This included Geronimo's mother, his wife and three children. During the revenge attacks that took place on the Mexicans he was given the name of Geronimo. Geronimo became a war leader and in 1858 Geronimo and his warriors won a great victory at Namaquipa. The discovery of gold at Pinos Altos, New Mexico, increased the number of Americans travelling through Apache land. This resulted in attacks by war chiefs such as Geronimo and Cochise. This included the attack at Apache Pass on 14th July, 1862. In 1876 the American government ordered the Chiricahuas from their mountain homeland to the San Carlos Reservation. Geronimo refused to go and over the next few years he led a small band of warriors that raided settlements in Arizona. Geronimo also attacked American troops in the Whetstone Mountains, Arizona, on 9th January, 1877. This was followed by a rare defeat in the Leitendorf Mountains. 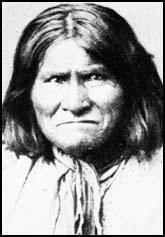 Geronimo was captured when entering the Ojo Caliente Reservation in New Mexico. Geronimo was eventually released and by April 1878 he was leading war parties in Mexico. The following year Geronimo surrendered and settled on the San Carlos Reservation. However, in 1881 Juh and Geronimo and their people left the reservation and headed for the Sierra Madre. In 1882 they carried out their most ambitious raid of all when they attacked San Carlos. Geronimo and his people were taken to Florida and Alabama before eventually settling in Oklahoma. Ace Daklugie and S. M. Barrett worked with Geronimo on his autobiography, Geronimo's Story of His Life in 1906. Geronimo died at Fort Sill, Oklahoma, on 17th February, 1909.